I make it a point to periodically check Greg Segal's web site to see if he's uploaded any new articles or essays. Greg is a very good writer with some thought provoking insights into music. Around the same time the new Jugalbandi CD arrived I found that Greg had posted a series of email exchanges between himself and the outstanding improvisational guitarist Eric Wallack. Eric had posed a number of questions to Greg, part of which centered around the dynamics between the guitarist and drummer, and the differences between working with his brother M. Segal in Paper Bag and Hyam Sosnow in Jugalbandi. And with Eric later posing the question of working with Greg as a guitarist to Hyam, we are treated to a unique peak into the musicians' thoughts as regards the interplay between themselves and those they are creating music with - in this case improvised music. (CLICK HERE to read this email exchange.) Not only are Greg and Hyam warmly complimentary of each other, but they give detailed reasons for their admiration. So... it was with this commentary from Greg and Hyam fresh in my mind that I dove into the latest Jugalbandi release - Night Crazy (Jugalbandi is the duo of Greg Segal on guitar and assorted other instruments and Hyam Sosnow on drums and percussion). It's obligatory to include in each Jugalbandi writeup that Jugalbandi music is all improvised, with Greg and Hyam employing their 5 tiered Jugalbandi Improvisation Level Classification System, which assigns a level number to each musical piece based on how much of it was improvised (see their web site for a detailed explanation). After a brief dulcimer and tabla duet, the boys launch into the title track, which opens with dark and foreboding guitar atmospherics along with steady, narrative drumming. Initially it reminded me of an old time Yes-like intro, though a bit spacier. The tension builds with Greg kicking out winding spacey notes while Hyam controls the pace and contributes to the intensity. The guitar then kicks into a more aggressive King Crimson-ish gear, though it's with a cosmic glissando sensation. This really recalls the spirit of the old Crimson improvs. As the music progresses Greg starts to rip it up on the guitar. I really got into his two recent solo CD's (see reviews this issue) but boy does it feel good to hear him rocking out. Nearly 17 minutes of space-prog fun. 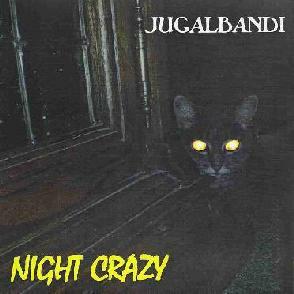 Night Crazy also includes some tracks that are a bit different for Jugalbandi. "Beanwater Junction" parts 1 and 2, both consist of rockin' acoustic guitar and drums duets. "Pleasure Circle" features Greg on processed recorder. And "Yarmishu Jim" consists of Frippoid licks and kalimba (a sort of thumb-piano with roots in Africa). The spirit of Fripp is heard quite a bit on this album, though taken down Greg's own trademark path. Even more mind-bending guitar can be heard on the 12 minute tension fueled "The Lost Transit Center". Hyam goes tribal on the skins while Greg wrenches acid space droned licks from the guitar, creating an edge-of-your-seat intensity that had me riveted throughout. We're back in King Crimson territory on "Successfully Assimilated, Part 2", though Greg and Hyam manage to create a stranger and more rockin' exploratory groove. Hyam is a man possessed while Greg calmly focuses on individual fibulating, acidic, screaming notes. And "Defeat Garbanzo Medallion" is the most ripping acidic heavy-psych number of the set. A great closing track. Visit the Greg Segal web site at: http://www.gregsegal.com.